SWAYAM registration 2019: SWAYAM (Study Webs of Active learning for Young Aspiring Minds) is an online portal to provide best teaching-learning experience. Candidates can apply for SWAYAM here. Any learner can register to this portal for online courses. The availability, of course, keeps on changing as it depends on the no of institution, requirement of respective course, faculties and various other factors. 2 How to do SWAYAM Registration? The basic objectives of launching SWAYAM scheme includeCreation of content of courses from secondary school level to post graduation level for all the disciplines and making it available on the SWAYAM Portal. To make an online platform for running and hosting thousands of courses in a single platform. Conduction of online examination and awarding certificates to the learners on completing the course. Recommend institutions for implementing Choice Based Credit System (CBCS) on SWAYAM courses. It is also aimed to address the needs of learners and students studying in universities and colleges across the country. SWAYAM offers various courses to the learners. Some of these courses are self-paced courses and some of them are scheduled courses. Learner can register for self-paced courses at any time as per their convenience whereas for scheduled courses they need to register at least 60 days before the course starts. Learners can check the schedule for such programs in the official portal by searching the respective course. Registration process for ARPIT exam has been completed. Registered candidates can download their admit card from 9 March onwards. Those who have not been able to register for current session can register in next session. There is not any eligibility criterion specified for any learner under this portal. As the main aim of this SWAYAM is to develop skill, knowledge, and education of every citizen of India there is no provision for eligibility criteria. Any individual of any age, qualification, any caste/creed, any location can avail any course delivered through the SWAYAM portal. However, in order to get certificate, learners have to check the eligibility requirement of the respective course in the portal. 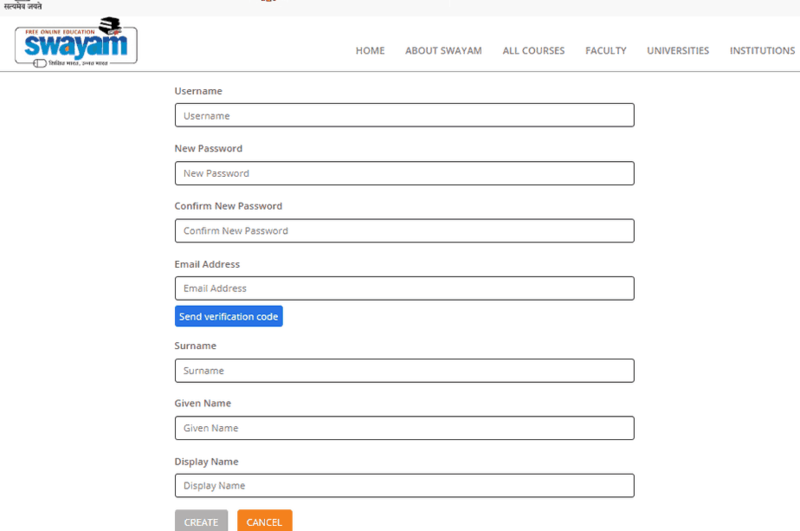 How to do SWAYAM Registration? They need to click “Register” button provided on the top of the homepage. Now learners have to login. They can login with their social media login (facebook, Google or Microsoft) of they can log in by clicking the “sign up now” option. On clicking the sign up now link, the given page will appear. Learners now have to provide all the details to create the account. A verification code will be send to the email ID and they have to click on “Create” button after the entering the names in the required fields. Learner’ account on SWAYAM will be created finally. No fee is charged for any learner. The courses provided under this portal are free of cost. However, learners who want certification after the completion of the course are required to pay a specified amount of fee (which is usually low). Such candidates must be registered with the portal. Certificated will be allotted to only those candidates who are registered and have paid the course fee. Students need to have an active internet connection to avail the online course content. Without internet or with a poor connectivity they will not be able to consume the online content. A desktop or laptop with internet connection and flash player installed in it. Operating system- Mac iOS, Microsoft Windows, Android, Linux. Students can also download the content. The respective faculty will provide the download access. Once the registered candidates have completed the course, they have to appear in the examination. Evaluation is the responsibility of the host Institute and Principal Invigilator (PI). Evaluation is done on the basis of performance of the learners in the examinations, assignments, practical, and credit earned during the course. After conduct of the examination and completion of the evaluation process, Grade/ Marks are awarded to the learners as per the evaluation scheme. The final marks/grade are communicated to the learners/students within 4 weeks from the date of completion of the final examination. After the process of evaluation process and declaration of result, certificates are issued to the successful learners. Certificate is issued by the PI and is sent to the parent institute. How to check the SWAYAM Test result? The result is declared after the conduct of the examination. It is also made available on the SWAYAM portal. Learners just have to visit the portal and have to click on the result link provided on the homepage. Now they have to enter the “Participant ID” generated at the time of registration and have to click on “View Result”. The scorecard will appear on the screen. They can also download it. Candidates those who are interested in taking education through SWAYAM can avail it from online website or also on its application. SWAYAM application is also available and can be downloaded from all the popular app store. Who can register a course on SWAYAM? Any person in the world can register for a course on SWAYAM. Who issue the certificate after the completion of the course? The certificate is issued by the host institute. What courses are delivered at SWAYAM? SWAYAM host courses from class 9th to Postgraduation level. Massive Open Online Courses (MOOCs) are the online courses which are developed as per the specified teaching pedagogy i.e. four-quadrant approach and are made available on the SWAYAM platform. Who prepared and delivers the online courses (MOOCs)? MOOCs are delivered by the nine National Coordinators (NCs) appointed by the MHRD. These NCs include UGC, NPTEL, NCERT, CEC, IGNOU, NIOS, NITTTR, IIMB & AICTE. What are the prerequisites for SWAYAM registration? Learners are required to have a name and a valid email ID for registration. How learners will know that their account has been verified? They will receive an email notification from [email protected] on their registered email IDs. How a learner can search the course? They can search it category-wise or just by their own keyword. Are the courses on this portal are free? All the courses are delivered free of cost. However, learners have to pay the prescribed fee if they want to appear in the exam and get certificate. How to find the eligibility for a course? Eligibility and all the details about the course are mentioned on the Course page. For how many courses a learner can apply? A learner can apply for multiple courses after registration. Is there any deadline or time limit to the courses where a candidate is enrolled? There is a deadline for scheduled courses; candidates cannot enroll in these courses after the course is started. There is no time limit for self-paced courses. Is there any facility to access the content offline? No, to access the content learners needs to have an active internet connection. How one can earn credits after enrollment? By going through the course material provided by the faculty and by watching the course videos. Is it necessary to watch all the videos in the course to earn credits? Yes, it is important to watch all the videos and go through all the material provided in the course. Can assignments be submitted online? If you have any question then you can ask us in comment below.